Marine aquariums can be a very rewarding and fascinating hobby. Standing in front of the aquarium with a cup of “something” and watching the habitat that you have carefully recreated can be a truly satisfying experience. However, before setting up a saltwater aquarium, there are some factors and processes that you have to take into consideration. This guide will cover most of the tools and accessories that will make your hobby a little easier and accessible. 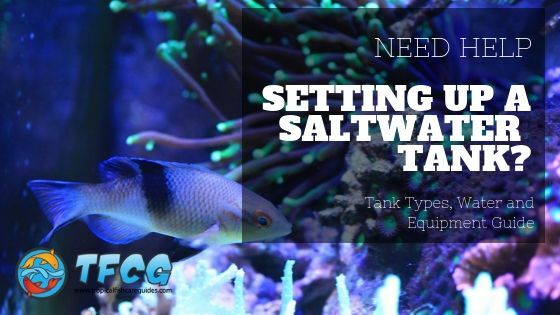 Here is all you need to know on how to set up the ideal saltwater aquarium. The first thing you will need to do, even before choosing a tank or the fish, is deciding on a location to place the aquarium. Ideally, you should find a spot that is not near a window, heater, radiator or air conditioner vent. The location should always maintain a stable temperature, as sudden shifts can affect the quality of the water and, naturally, the fish. Another thing that you want to avoid is direct sunlight, as this can cause invasive algae to develop in the tank. Furthermore, you want a location that will make the aquarium easy to maintain and be seen. Once you choose a spot, stick with it as much as possible – moving the aquarium can be a drag, requiring you to drain the water and disturb the animals. Once you have picked the perfect spot for your miniature habitat, it is high time to choose an aquarium. The main thing to take into consideration here is the material. There are two types: glass and acrylic. While both of them have their own advantages and disadvantages, most experts and aquarium aficionados will recommend glass aquariums, especially for beginners. • Lighter and more versatile than glass aquariums. • They can be shaped into fewer pieces, reducing the risk of leaks by leaving fewer seams. • Their moldable nature is perfect for people who are looking for unconventional aquarium shapes. • They scratch very easily, a fact which doubles the cleaning time and effort, and makes the placement of decorative pieces (rocks, logs, and so on) very tricky. • They are costlier than glass aquariums. • They are stable, resistant to scratches and maintain their clarity over time. • Glass aquariums are the cheaper and sturdier option. • They’re much heavier than acrylic aquariums. • More prone to suffering leaks due to weight. When it comes to aquariums, size does matter indeed. Essentially, you want to choose the biggest tank that your budget can afford (as long as you have room for it, of course). In time, your fish will grow in size and you will want to decorate your tank with corals (which also increase in size). Soft corals, for example, can double in size every few years. Another thing to consider is that fish will grow, so you have to give them plenty of room to evolve and feel comfortable. Another thing to take into consideration is lightning. Providing the right kind of light is important because you will want to provide your saltwater fish with a regular cycle of day and night. This will help reduce the fish’s stress which, in turn, minimizes their risk of going down with diseases. • Fluorescent lights – the easiest and most inexpensive way to light up an aquarium. They are available in a wide variety of colors. However, they are good solely for fish-only tanks. • LED lights – a good alternative to fluorescent lights, they are bright enough to maintain coral formations. Some of them can be programmed to turn on and off gradually to simulate the day and night cycle mentioned above. • Metal Halide Lights – they provide an intensity that matches that of natural daylight. This factor is important, especially if you want to maintain lots of corals into your tank. Their main disadvantage is the cost and their high usage of electricity. The next important thing you need to set up is the filtration system. The best systems use a process called ‘’biological filtration’’. Fish generate a toxic substance called ammonia, and the bacteria from the filter convert it into nitrite, a substance which is slightly less toxic. • Wet/Dry Trickle Filters – they are attached to the back of the aquarium and work by pumping water out of the tank into a container. Only suitable for small aquariums, under 55 gallons. • Undergravel filters – Although their popularity has been dwindling in the last few years, they are still worth mentioning if you intend to get a small aquarium with a low variety of fish. • Canister filters – they sit below the aquarium and feature a pump that draws water out of the tank, through the filter, and then pumps the water back into the tank. It is essentially a combination of mechanical and biological filtration. • Live Rock/Live sand filters – arguably one of the best choices available, as it contains ocean-cultured sand along with bacteria necessary for proper water filtration. When it comes to filtration methods, there is also a point to be made about using carbon in saltwater tanks. Contrary to popular belief, carbon is not harmful to saltwater species – it actually has great benefits because it filters the water, and clears the waste trapped in the filtration pad. Now that we have talked about tanks and filtration systems, it is time to talk about the water. Let us get one thing out of the way – tap water is not recommended, as most city water supplies contain chemicals that could pose a danger to the fish (nitrate, copper, chlorine, and so on). While the chloramine and chlorine can be easily removed by using chemicals, other toxins will remain and gradually build up into the water. The best type of water to use for the aquarium is called ‘’Reverse Osmosis De-ionized’’ water. Also called RO water, it can be found in nearly every aquarium store. The reason why we recommend this type of water over others is because it strikes the right bacteria balance to support a healthy medium for the fish. This concludes our article about saltwater aquariums. To summarize, glass aquariums are generally better than acrylic because they are more stable and easy to maintain, choose RO water (or distilled if you can’t find any), and always make sure to maintain the fish’s stress at a minimum by establishing a consistent day-night cycle. Setting it up is not that hard as long as you take into consideration a few factors, such as your experience and the amount of time you want to invest into the care and maintenance of the aquarium.